It was 1774 that a Methodist Society met to organize near Sudlersville as Methodists began to set foot on the Delmava Peninsula. The Methodists had a big impact on building a new nation. 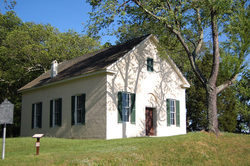 Dudley's Chapel built in 1783 was the first Meeting House in Queen Anne's County. It is one of the earliest surviving Methodist Churches in the Nation. One and one half acres of land was deeded from part of the farm owned by Joshua Dudley. It was once known as "Queen Anne's Chapel" and called Dudley's Chapel for the first time in 1812. Dudley's served as a school from 1810 until 1865. Great Methodist leaders preached there including Bishop Thomas Coke and Bishop Franicis Asbury, the men that developed the plan that organized the Methodist Societies in America into the Methodist Episcopal Church of 1784. It was listed on the National Register of Historic Places in 1979. Dudley's Chapel now celebrates 229 years.